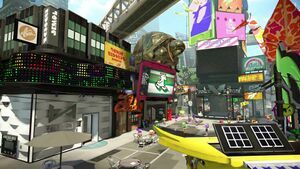 The Galleria is a row of shops on the left side of Inkopolis Square that contains the gear and weapon vendors in Splatoon 2. Ammo Knights is a weapon shop run by Sheldon. It can be accessed from the Galleria. Players can purchase weapons here with in-game Cash earned in multiplayer matches and Salmon Run shifts. However, players have to be at least level 2 to be allowed to buy weapons here. 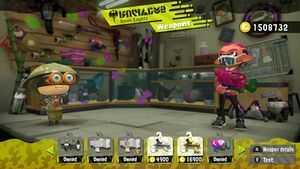 Ammo Knights sells weapons of all weapon classes: blasters, brellas, chargers, dualies, rollers, shooters, sloshers and splatlings. It also features a Shooting Range to experiment with potential purchases. Headspace is a headgear shop run by Flow and Craymond. It can be accessed from the Galleria. 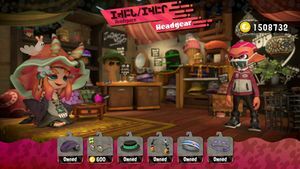 Players can purchase headgear here with in-game Cash earned from multiplayer matches and Salmon Run shifts. However, players have to be at least level 4 to be allowed to buy headgear here. Like all gear stores, the merchandise changes every day. Ye Olde Cloth Shoppe is a clothing shop run by Jelfonzo. It can be accessed from the Galleria. 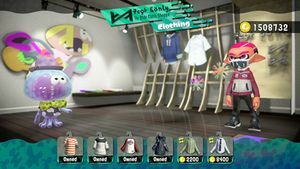 Players can purchase clothing here with in-game Cash earned from multiplayer matches and Salmon Run shifts. However, players have to be at least level 4 to be allowed to buy clothing here. Like all gear stores, the merchandise changes every day. Shella Fresh is a shoe shop run by Bisk. It can be accessed from the Galleria. 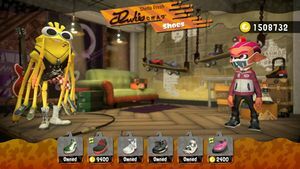 Players can purchase shoes here with in-game Cash earned from multiplayer matches and Salmon Run shifts. However, players have to be at least level 4 to be allowed to buy shoes here. Like all gear stores, the merchandise changes every day. In each shop one of the four variations of DJ Real Sole's song New You can be heard. Flow's version of the song is simpler and more soothing, matching her calm yet spacey personality. This also reflects a contemplative or mindful tone, referencing how the gear she sells is worn on the head. Jelfonzo's shop focuses on gear worn on the middle of the body, so his music emphasizes the melody or "middle" of the song. It features synthesized sounds and is rendered louder than the other versions, possibly reflecting Jelfonzo's charismatic and energetic personality. Since Bisk's shop focuses on items on the lower half of the body, his version focuses on the "lower" parts of the song, with an emphasis on percussion and bass. Bisk's version is somewhat faded, composed almost entirely on the electric guitar, corresponding with his laid-back personality. Notably, this is also a reference to his interest in music, as an electric guitar sits on a stand in the back of his shop. Esukabēsu Escabase, a pun on escabeche and base.